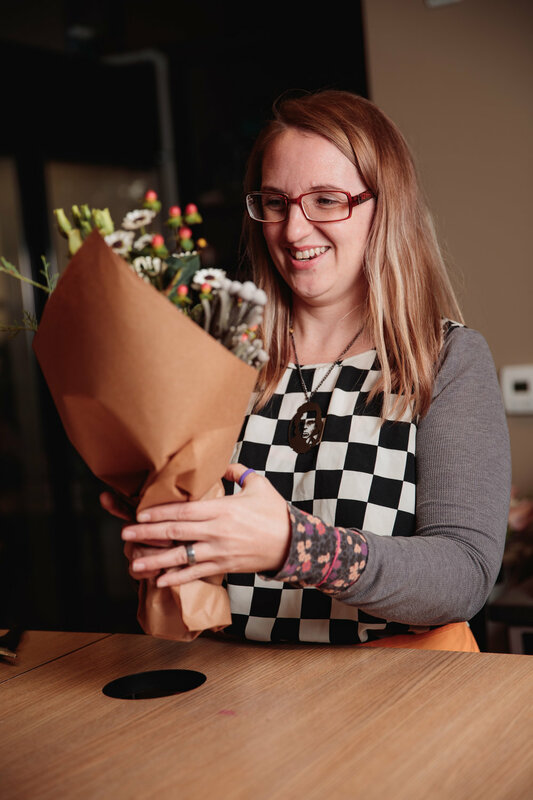 Welcome to the Paper Daisy Flower Boutique, a Short North start up committed to the smell of fresh flowers, and the sigh of cut stems. 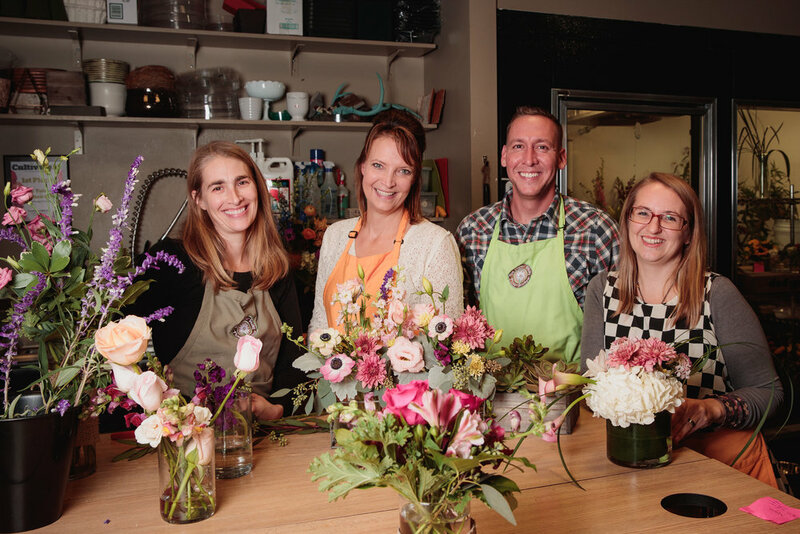 Stop by the Flower Bar for a pick up, a consult, or a nice conversation. And don't forget to say hi to Melvin, the shop dog, while you're in. The Paper Daisy Flower Boutique is thrilled to call the Short North our home! Locally owned and operated, we are committed to bringing high quality products and first-class customer service to our neighbors at unbeatable prices. Be it a housewarming, baby shower, party, or wedding, we've got the perfect gift for the people in your life who mean the most. Photo by Robb McCormick Photography. Place of birth: Born in Tokyo and raised in Hong Kong. I love bringing my international experience into the design of the store and the personalities of our arrangements. Proudest achievement: Mother of three grown children, and boutique dog, Melvin Stanley. Favorite thing to do outside the shop: Traveling the world with my husband and family, while scoping out new treasures to bring back to the boutique. Length of time at The Paper Daisy: Four years. Favorite part of working at the shop: The great team! Favorite thing to do outside the shop: I love to read. I also enjoy hiking, and visiting Columbus’ beautiful local parks. Dog person or cat person: Both, but if I had to choose an animal it would be a guinea pig. Favorite memory from the shop: One of the first orders I filled and delivered was for Laughlin's, a local bakery. They were newly open and someone had smashed their window flower box, so an admirer wanted to send them fresh flowers. It was very fulfilling to design for another local business - we love their delicious contributions to the local flavor! 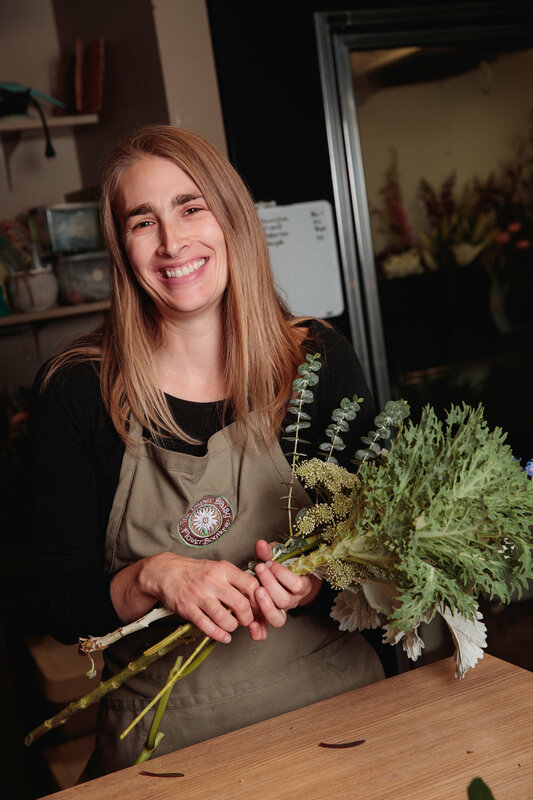 Favorite part about working at the shop: I appreciate Kim as a female small business owner who provides a supportive and flexible work environment. She is truly trying to be a responsible employer who is conscientious of fair business practices. And she's generous with the sushi!! Favorite thing to do outside the shop: My hobbies have mostly taken a back seat to a rambunctious 4-year-old and creative teen, but I sneak in some juvenile fantasy fiction, bread baking, and critter catching as I can. Dog person or cat person: I like both. we own cats but will likely end up with a doggie companion sooner than later. Length of time at The Paper Daisy: Almost a year. Favorite part of working at the shop: All the laughter. We all have very different personalities and were able to balance each other out. Favorite part about working at the shop: I enjoy the creativity, and love to bring smiles to people’s faces through my arrangements. Favorite season/event/flower type to design for: I love designing for weddings and designing with orchids. Your superpower and your kryptonite: Invisibility would be my power, for sure, so I can go wherever I please. My kryptonite would be that my mouth goes faster than my brain sometimes. Length of time at The Paper Daisy: Four years. Or rather, 28 for me. Time flies at The Paper Daisy! Favorite part of working at the shop: Saying hi to all the people, especially the ones who bring me treats. Favorite memory from the shop: This afternoon was pretty great. Favorite thing to do outside the shop: I really like to walk and run, and I also like naps and food and smelling stuff. Favorite food: Literally everything except dog food. Dog person or cat person: Ugh, don’t get me started on dogs. Hayley, Kim, David, and Dawn. Photo by Robb McCormick Photography. Whether it's old-school formal, or new-age chic, we've got the perfect thing. 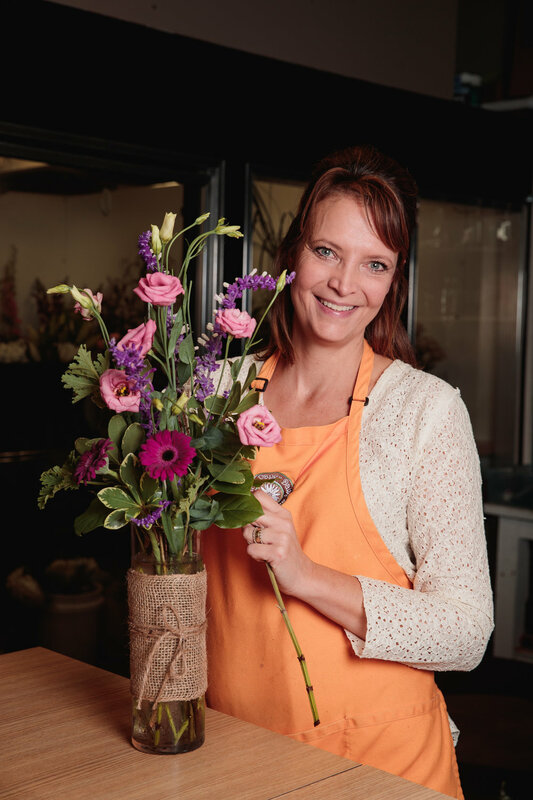 No matter what your price, preference, or aesthetic, our incredible designers are ready and willing to work with you to craft the perfect arrangement for any occasion. Stop into the Flower Bar for a consultation or conversation (or to give our shop dog a pat on the head). We'll take it from there. Start your forever with us. You've found your perfect person. We'll take it from here. We've got the perfect thing. There's always something new in the shop. Stop by to browse the latest finds from local artists and national craftsmen. Find the perfect gift for the wedding, party, housewarming, or just-because for your special-someone.